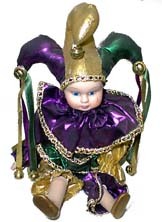 A Mardi Gras jester doll wearing purple, green & gold apparel. The jester hat has three small bells at the ends of the hat. This doll is 7 inches tall when seated, but the legs can be adjusted for standing (Which brings it to 10" tall). It is approximately 4.5" wide.